There are all kinds of board games. You've got your dexterity games, which generally mean you have to flick a piece of wood with your middle finger in an attempt to put out your brother's eye. You've got your abstract games, which are almost always made out of wood and have no theme at all and tend to only accommodate two people. You've got your card games that play like board games, and board games that play like card games, and strategy games and party games and train games and kids games and stupid games that you wish your mom would lose so you could play something else when you visit for Thanksgiving. But until now, I had never played a yelling game. The Resistance has a tendency to create some yelling situations, but it's not technically about the yelling, it's more about the deceiving your friends, who then yell at you for lying to them. 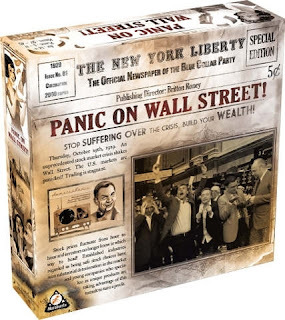 Panic on Wall Street, on the other hand, is all about yelling. It's a pretty basic idea. You take a good-sized group and split it in half. Then you make half those people stock-brokers, and give them companies whose stock needs sold, and the other half are investors. The game has two winners, the best broker and the best investor. And there is a ton of yelling. How you play is, you flip over a timer, and then you all start yelling. "I will sell this green for twenty!" you will yell. And "Yellow for thirty! Yellow for thirty! Yellow for thirty!" And "I'll give you fifteen for blue!" And "Shut up you slackwit asshats, I'm trying to watch television!" You won't be yelling the last one. That will come from anyone in the same building. This yelling segment of the game is called the negotiation. There are other parts of the game, namely the parts where you try to get everyone to quiet down so you can figure out how much money they made, but the yelling part is the fun part. As long as you like yelling. If yelling very loudly and very often makes you uncomfortable, or if you like to relax and not get wound up trying to sell stock to your friends, you are unlikely to enjoy Panic on Wall Street. Me, I like yelling very loudly and very often, so I thought this was a hoot. Once you finish the part of the game where you're not yelling, you will auction off more companies (this may involve some yelling) and then the next round begins. In the next round, just to mix it up and try for some variety, there will be a lot of yelling. Because it's basically the same thing again. I did enjoy the vigorous and extremely noisy game of negotiation and yelling that we played. Unfortunately, I'm not likely to play it many more times. For one thing, you need a decent-sized crowd. There are rules for playing with three, but it wouldn't be the same game. To truly experience Panic on Wall Street, you need lots of people for maximum yelling. And it's rare for me to have eight other people willing to play a yelling game. In fact, that's the second barrier that will stop me from playing Panic on Wall Street again - most of my gamer friends are not going to want to be involved in a yelling game. We usually get together, drink a few beers, crack wise, laugh, and play games that don't have overly complicated rules. The rules for Panic on Wall Street are easy, but it's very loud and not at all conducive to a relaxing evening. It's conducive to lots of high-energy yelling and possibly stress migraines. So will you like Panic on Wall Street? That depends. Do you know five or six other people who like to yell at each other? If so, you will like it. If you only like to play games with your wife over a glass of wine, you will absolutely not like Panic on Wall Street. Or pretty much any other yelling game, although I don't know of any other yelling games. So, basically, this is a more gamerly version of Pit? Oh yeah! Pit is another yelling game! I haven't played that since ninth grade, so I completely forgot about it. So yes, it's a lot like Pit.